Is Europe the land of freedom of expression? The European Court of Human Rights has stressed on numerous occasions that freedom of expression constitutes “one of the essential foundations of a democratic society”, and that “it is applicable not only to ‘information’ or ‘ideas’ that are favourably received or regarded as inoffensive or as a matter of indifference, but also to those that offend, shock or disturb the State or any sector of the population”. With the secularisation of Europe, and the commitment to freedom of expression, the offence of blasphemy has slowly been disappearing from criminal codes in European countries. Stories of people being convicted of blasphemy or “religious insult” are usually associated with hardline theocracies outside Europe. And yet, several European countries – many of which are EU Member States – still condemn and penalize blasphemy and/or ‘insult’ to religion. Even where these laws are rarely implemented, they can still lead to fines and imprisonment in some countries, such as Italy and Greece. Moving beyond strict EU borders, into Russia or Turkey, the sentences become harsher and more frequent. Even rarely-used “blasphemy” laws have a negative deterrent effect on freedom of expression and lend legitimacy to harsher and more widely enforced laws elsewhere. Even if most European-based cases end up in acquittal, the constant threat of blasphemy hanging over individuals represents a threat to freedom of expression in some of these countries. 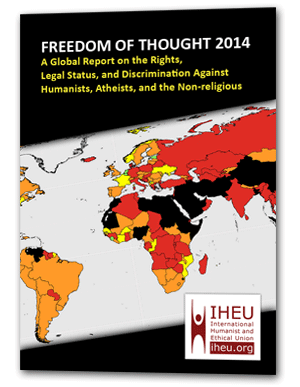 The European Humanist Federation (EHF), a founding partner behind the End Blasphemy Laws campaign, is the leading humanist and secular organisation in Europe and has always advocated strongly in favour of freedom of expression. As a recognized EU partner, the EHF regularly meets with the European Commission, the European parliament and the rotating Presidencies of the Council of the EU. The EHF was involved in the drafting of the 2013 EU Guidelines on Freedom of Religion and Beliefs and made sure that those guidelines respected the rights of believers and non-believers alike, while ensuring the respect of freedom of expression. The subject of freedom of expression has also been brought to the Latvian, Italian and Greek presidencies in the past year and a half. The EHF delegation at the Council of Europe and the OSCE outlined on numerous occasions that the right to freedom of thought, conscience or belief is a right granted to people, not to their beliefs. Non-violent forms of contestation against a belief such as caricatures or protests should be allowed as a legitimate form of expression. Therefore, the EHF called on Member States to abolish blasphemy laws, as recommended by the Venice Commission of the Council of Europe.